AMD Cubemapgen is a useful tool which allow cubemap filtering and mipchain generation. Sadly, AMD decide to stop the support of it. However it has been made open source  and has been upload on Google code repository  to be improved by community. With some modification, this tool is really useful for physically based rendering because it allow to generate an irradiance environment map (IEM) or a prefiltered mipmaped radiance environment map (PMREM). A PMREM is an environment map (in our case a cubemap) where each mipmap has been filtered by a cosine power lobe of decreasing cosine power value. This post describe such improvement I made for Cubemapgen and few others. Latest version of Modified Cubemapgen (which include modification describe in this post) are available in the download section of the google code repository. Direct link : ModifiedCubeMapGen-1_66 (require VS2008 runtime and DX9) . This post will first describe the new features added to Cubemapgen, then for interested (and advanced) readers, I will talk about theory behind the modification and go into some implementation details. – Use Multithread : Allow to use all hardware threads available on the computer. If uncheck, use the default behavior of Cubemapgen. However new features are unsupported with the default behavior. – Irradiance Cubemap : Allow a fast computation of an irradiance cubemap. When checked, no other filter or option are take in account. An irradiance cubemap can be get without this option by setting a cosine filter with a Base angle filter of 180 which is a really slow process. Only the base cubemap is affected by this option, the following mipmap use a cosine filter with some default values but these mipmaps should not be used. – Cosine power filter : Allow to specify a cosine power lobe filter as current filter. It allow to filter the cubemap with a cosine power lobe. You must select this filter to generate a PMREM. – MipmapChain : Only available with Cosine power filter. 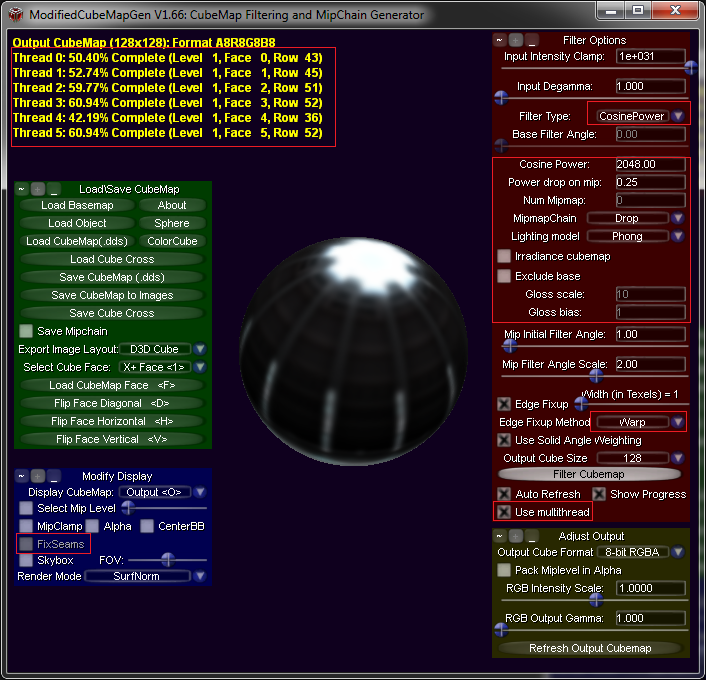 Allow to select which mode to use to generate the specular power values used to generate each PMREM’s mipmaps. – Num Mipmap, Gloss scale, Gloss bias : Only available with the Mipmap mode of MipmapChain. Use to generate specular power values used for each PMREM’s mipmaps. The value of Num mipmap, Gloss scale and Gloss bias will be used to generate a specular power value for each mipmap. – Lighting model: This option should be use only with cosine power filter. The choice of the lighting model depends on your game lighting equation. The goal is that the filtering better match your in game lighting. – Exclude Base : With Cosine power filter, allow to not process the base mimap of the PMREM. – Warp edge fixup: New edge fixup method which do not used Width based on NVTT from Ignacio Castaño. – Bent edge fixup: New edge fixup method which do not used Width based on TriAce CEDEC 2011 presentation. – Strecht edge fixup, FixSeams: New edge fixup method which do not used Width based on NVTT from Ignacio Castaño. FixSeams allow to display PMREM generated with Edge fixup’s Stretch method without seams. All modification are available in command line (Print usage for detail with “ModifiedCubemapgen.exe – help”).